Script by Frank Miller, Roger McKenzie, David Micheline and Mike W. Barr, and art by Frank Miller and Klaus Janson. Full credits are detailed further in this article. All illustrations are ©Marvel Comics. For a complete list of all books reviewed in this blog, please visit the index page. Originally published in 2007 by Marvel (same cover price), my copy is from the second print published in October 2013 (ISBN: 978-0-7851-8568-0, 11 x 7.5 inches or 28 x 19 cm, 830 pages, cover price $99,99). This massive book, edited by Mark D. Beazley and designed by Tom Marvelli & Patrick McGrath, is printed on glossy quality paper and features a fully illustrated jacket. Notice that a variant dust jacket cover has been produced for the first print. Here are pictures from this edition found on ebay listings. A third print has been released in 2016, and has probably a smaller paper thickness, and perhaps some additional bits. The inner book (identical for all versions?) comes with an illustrated hardcover. Second and third of covers are not illustrated. 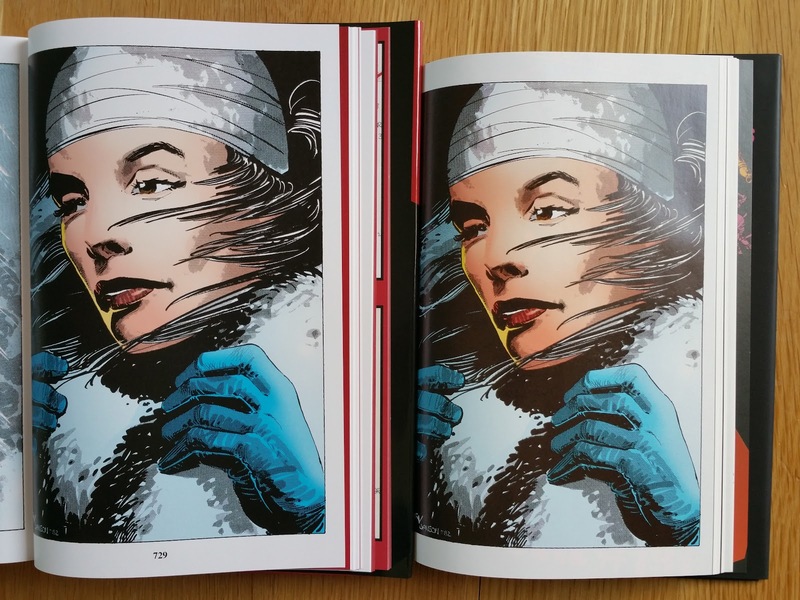 There is also a picture below for size comparison with volume 1 of the Graphitti Designs Visionaries collection, and another picture showing the binding quality (printed in China). After the detailed credits pages, we find the 2000 Frank Miller's introduction, followed by the 2001 Klaus Janson's introduction, both from the Graphitti Designs Visionaries collection. This edition collects Daredevil #158-161, #163-191 and What If...? #28. Each original issue cover is displayed. I have chosen excerpts displaying in my opinion Frank Miller's visual art of storytelling. TDKR is not far .. Awesome omnibus. 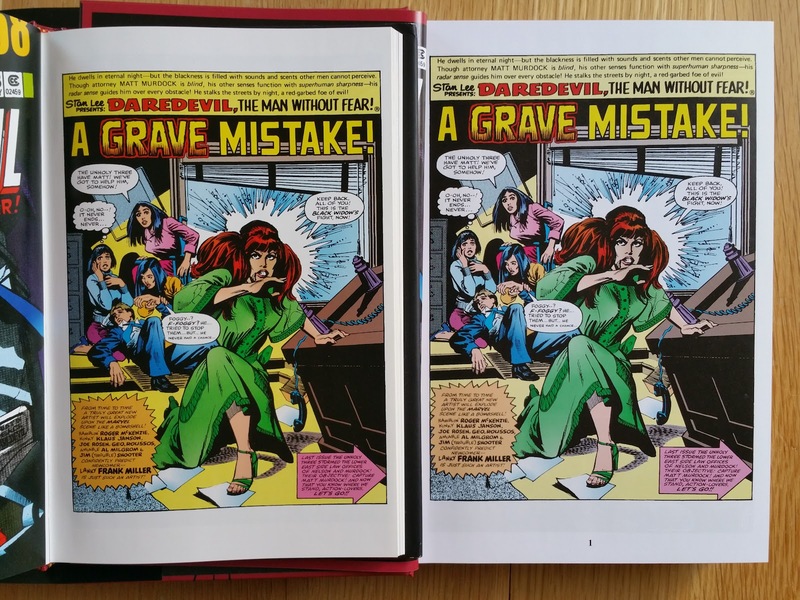 The modern re-coloring is a point of contention for some fans- DD appears orange in some panels due to the digital blends used. I still love the art & story and consider this a must have/read for fans of either DD or Miller. Hello! Is there any way you can give us a comparison between the omnibus and the Graphitti Designs HC set of 3? I can't decide which I would rather buy, if the price difference is worth it. As mentioned, alot of people complaining about the print quality of omnibus. How much better is Graphitti Designs prints? Maybe a comparison posting would be cool! Hi! Dully noted, I will look into that ASAP. The Omnibus uses the same sources as the GD Visionaries collection, and the paper quality is very similar if not the same (notice that I own the second print of this Omnibus, not the 2016 third print). So in my opinion your decision should not be based on the printing quality. I have added some picture above for comparison purpose, as well as credits details for the coloring/separations process for both editions. First of all, great site! I really enjoy reading your articles. 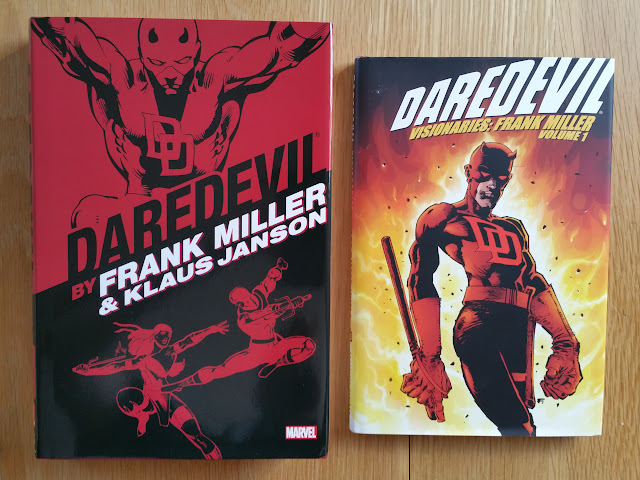 I'm seriously thinking about picking up the new printing of Frank Miiler DD omnibus as I've missed out on earlier editions. I'm just hoping to get confirmation on the overall quality of the new printing. Does it have the same paper quality/recoloured art /content of the earlier printings or does it differ in any way? Thanks so much for any more info you can share! Hi CadeFoster, and thanks for the kind words. I don't own the latest print (the third) but I am pretty confident that it contains at least the same material with the same printing quality. 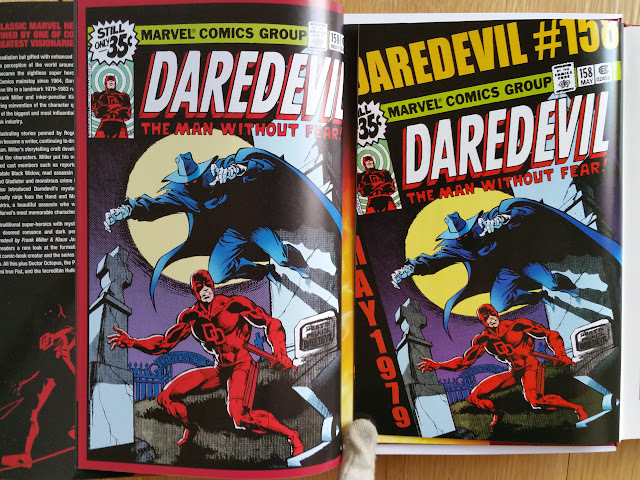 I am also sure that the paper quality has changed and is thinner than previous prints (see my article about Daredevil Omnibus Companion), without being an issue for the printing quality (and it is easier to read the book). We have discuss at length these topics on the CBR forum here http://community.comicbookresources.com/showthread.php?58350-All-New-Marvel-Collected-Editions/page299 (also see previous and further pages).